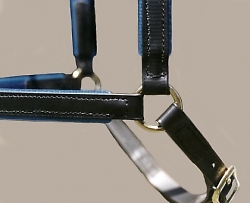 2) Use of pinned rings in place of the halter squares. These rings keep the nose band at perpendicular with the headstall cheeks. 3) Two piece adjustable chin strap. Sewn on the rings, easier to adjust and less stiff than the standard chin strap. See close-up views below. 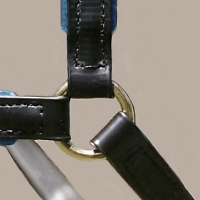 Bit hangers are included with the headstall. 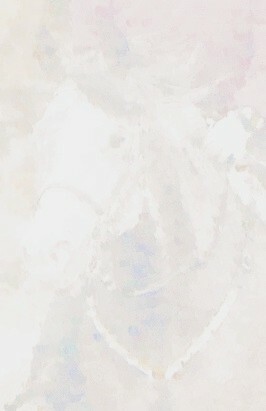 See the link to this headstall below. Below are many other choices in this style of combo. 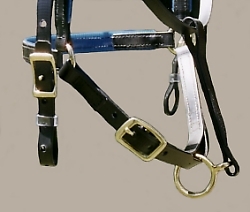 Below are a variety of Deluxe Endurance Headstalls. Click on links to the right of each image for details, price and to order online. In 2 widths - 5/8" or 3/4"
These rings keep the nose band perpendicular with the headstall cheeks. It is necessary to have overlays on both the cheeks and nose band with these rings. They can be one color if you prefer a solid color. Close-up of pinned ring option. Two piece adjustable chin strap. Sewn on the rings, easier to adjust and less stiff than the standard chin strap. This feature is available with many of the other headstall also.